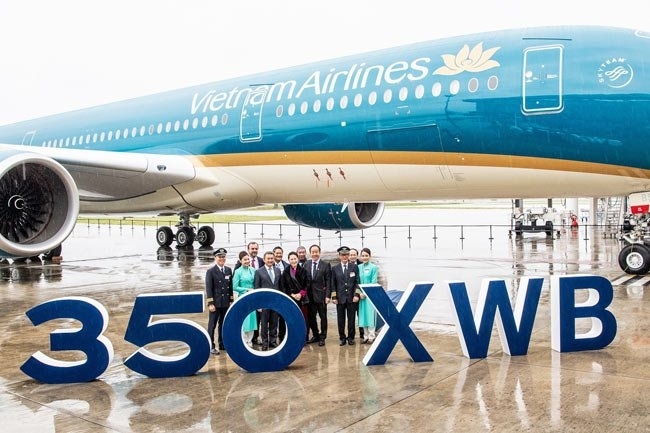 AsemconnectVietnam - National flag carrier Vietnam Airlines (VNA) on April 3 took delivery of an A350-900 from European plane maker Airbus in the French city of Toulouse, in the presence of National Assembly (NA) Chairwoman Nguyen Thi Kim Ngan, who is in France for an official visit. This is the 14th Airbus A350-900 to be added to VNA’s fleet, helping the air carrier move towards its target to become a five-star airline. VNA General Director Duong Tri Thanh noted that the Airbus aircraft family accounts for nearly 90% of VNA’s fleet. For his part, Jean-Francois Laval, Airbus executive vice president for sales in Asia, said, “Airbus is proud that Airbus aircraft have served as a platform for the airline to grow at home and abroad and contributed to the development of the Vietnamese economy." In July 2015, Vietnam Airlines became the first airline in Southeast Asia and the second airline worldwide to operate the new-generation wide-body Airbus A350-900 aircraft. Over the past four years, the carrier’s Airbus A350-900 fleet has been used on more than 30 domestic and international routes, primarily those to Europe, Australia and Northeast Asia and on the Hanoi-HCMC route. As of this month, VNA’s Airbus A350-900 aircraft have been used for more than 35,000 flights, carrying nearly nine million passengers. The upgraded Airbus A350-900 features a spacious cabin, higher ceilings, larger windows, more leg room, fully lie-flat business class seats and an upgraded entertainment system with a larger screen, contributing to VNA’s goal of meeting the five-star standards of international air transport rating organization Skytrax. Vietnam Airlines Group, including VNA, Jetstar Pacific and Cambodia Angkor Air, currently operates 105 Airbus aircraft, consisting of 89 narrow-body and 16 wide-body aircraft. VNA alone operates 86 Airbus aircraft and is the only airline in Vietnam currently operating the new-generation wide-body Airbus A350-900 aircraft.